Gina at SkinnyTaste has been one of my favorite bloggers and recipe developers for a long time. She is known for creating recipes that are packed with flavor, typically cut down on calories or bad-for-you ingredients, and work every single time. She has majorly jumped on the pressure cooker train, and I knew I had to give one of her recipes a shot. 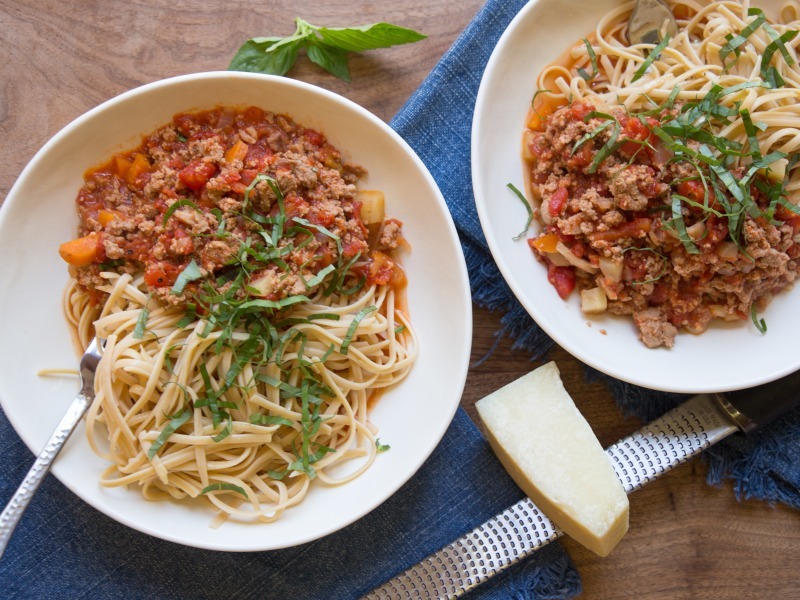 Her pressure cooker bolognese is fabulous, but I wanted something a little lower fat, so I subbed in ground turkey for ground beef, and Greek yogurt for heavy cream. I also love basil with my pasta, so I use basil here, instead of the parsley called for in her original recipe. Press Sauté on your pressure cooker to heat it up on Low. Add bacon and cook for 4 to 5 minutes, until fat has melted out from the bacon, and the bacon is opaque. Add butter, onion, celery, and carrots, and continue cooking until vegetables are soft, another 4 to 5 minutes. Add turkey, 1/2 teaspoon salt, and 1/4 teaspoon pepper, and cook until browned, about 4 minutes. Add the wine and continue stirring until it soaks into the meat, about 4 more minutes. Stir in the tomatoes, bay leaves, and remaining salt and pepper. Seal lid and pressure cook on High for 15 minutes. Serve over noodles or whatever you desire, and garnish with basil. 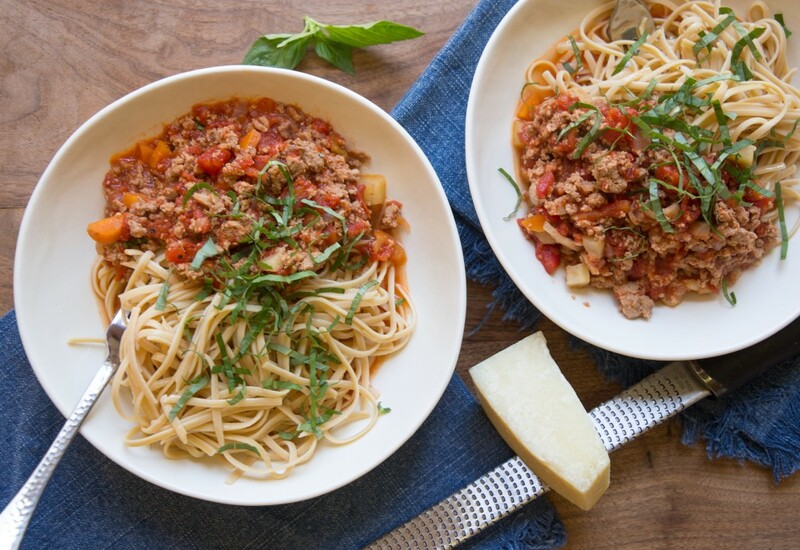 If you're serving your bolognese with noodles, cook your noodles while the pressure is naturally releasing from the pot! It'll take about the same amount of time, so everything will be ready at the same time! Per Serving: 348 calories; 23g fat; 5.0g carbohydrates; 30g protein; 120mg cholesterol; 510mg sodium. This recipe is absolutely delicious. I love to substitute greek yogurt as much as possible, so this is one of my favorite recipes for my MultiPot. Rather than doing white wine for this recipe I used red wine which gave it a really nice, deep flavor. I am recommending this recipe to all my friends with MultiPots and Instant Pots, so good! I love SkinnyTaste so I had to try this recipe! So great! It's definitely pretty light because it's turkey vs beef. You could easily swap in beef if you wanted that instead. I froze half of it for quick dinners later! I've made this recipe so many times, I love it! Not a big fan of turkey meat, but it worked so well in this dish. I'm trying to lose weight and this recipe makes trying new recipes fun and not dreadful. I hear the word "low fat" and automatically think gross. Well this recipe totally dispels that myth, can't even tell that it's a lightened up version. So good! Used turkey sausage & ground turkey. My so good. Quick & easy. Will make again!